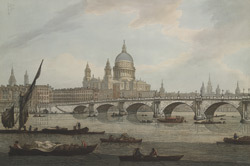 View of Blackfriars Bridge with St Paul's Cathedral in the background. This was the third bridge to be built to cross the Thames, this time between Blackfriars and Southwark. It was built between 1760-9 at a cost of £230,000, mainly paid for by fines from men refusing the post of Sheriff. The architect was Robert Mylne and he designed it to have 9 arches of Portland stone. It was originally called William Pitt Bridge but became more commonly known as Blackfriars Bridge. In 1785 the tolls for use of the bridge were removed.